Want to send Now Playing song data to your 2wcom RDS Encoder, from your Radio Playout/Automation system? MetaRadio makes this possible. This article explains the setup of MetaRadio and 2wcom RDS, allowing the use of RadioText and RadioText+ for Now-Playing song data. 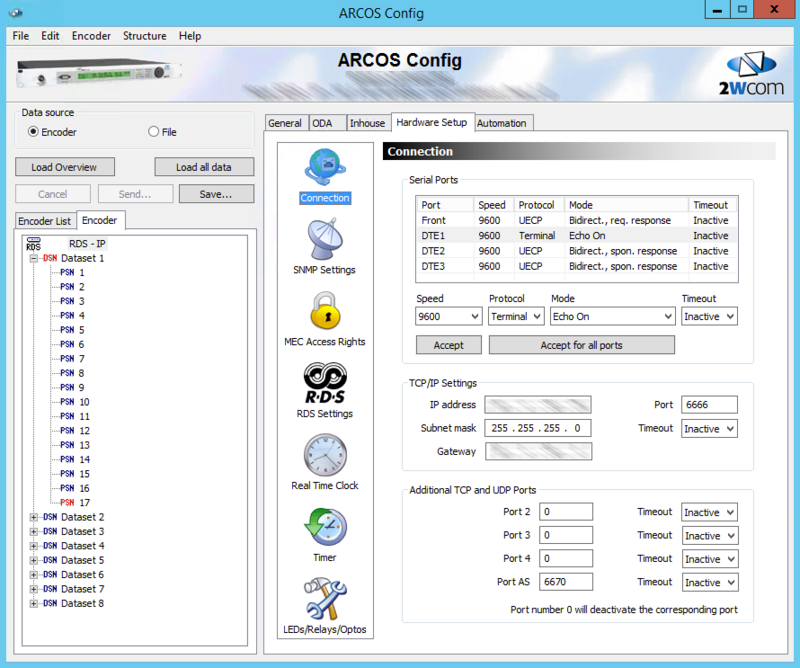 On the “Connection” screen, enter a Port Number into the “Port AS” field. We suggest “6670”. If you haven’t already configured an IP Address, on the “Device Setup” screen, specify a IP Address, Subnet Mask, and Gateway. This must be on the same subnet as your MetaRadio PC. On the “Connection” screen, select a Serial Port, set it to “Terminal” Protocol and select a baud rate (if in doubt, use the default of 9600). When configuring a RDS Output, you can enter a ‘Format String’ – this is a special field that allows you to define what text displays in the RDS RadioText field whenever a song is playing. You can enter any text into these fields, but there are also five special ‘merge codes’ (think of these like placeholders in a Mail Merge). Separate each of these five strings with a “+” symbol. You can enter arbitrary text into the ‘String 1’, ‘String 2’, and ‘String 3’ fields.